It is said that True law is inseparable from Justice, then why is it that our minister of Justice Judith Collins refers to our courts as courts of law not courts of justice. The quote above is direct from the Vatican and given the churches traditional role in law you have to wonder when the two started to drift part. I can only guess that this is the reason why so many lawyers associate themselves with the church, so many of them have good cause to ask for forgiveness or is it their perception of righteousness which brings them clients. This brings us to the question does God sit higher than a lawyer, do they sit equal or do lawyers trump God. Q. What’s the difference between God and a lawyer? A. God does not think he is a lawyer. Many may think that this is a joke but I have a very real story which confirms that there are Lawyers who believe they trump God. Fraser Powrie a Lawyer on the vestry of St Georges at the time and a Vicars Warden had been our neighbour for many years. His wife Elaine and I had shared the kindy run for my youngest child and her middle child. When I was sued for asking the simple questions “Why does this law enforcement authority not exist” and “ why is a council manager contracting the council resources out to this same fictitious organisation “ my then husband went to see Fraser Powrie and was billed $33,000 despite the years of cost effective services my husband had provided to the Powries as a neighbour helping out a neighbour. I had been taken to court for defamation and my defence of truth and honest opinion had been struck out through legal manoeuvring, Basically I had 2 weeks in which to find $12,000 and because I was a married woman I had no independent access to funds. When my defence was struck out we also skipped the formal proof stage and the matter went to court as though I had been found guilty of defamation. The matter went straight to quantum and I was fined $57,500 plus $41,000 cost for speaking the truth. Fraser Powrie came up with a solution for my husband and that was that 23 years into our marriage we were going to re write the marriage vows and introduce the concept of separate Debts into our marriage. I was told that I had to sign the documents which Powrie had drafted which was effectively a consent to a matrimonial property split. To encourage me into this action all the bank accounts were frozen and I was penniless. I suggested to my then husband that this would bring about an end to our marriage and I was told that I was black mailing. I however saw it as someone willfully re writing my marriage vows and breaking my marriage contract. Fraser Powrie motivated my husband in to this course of action by introducing fear into him. My husband believed that my honesty and truth would eventually cause us to lose everything and so he paid Fraser the $33,000 for the advice and the strategy which would ensure that I had no alternative but to sign the document but it also brought about the end to my marriage . I have asked the Anglican church if they could enlighten me to the order of things, how sacred is my vow , when a lawyer can force me to “ contract out” so to speak of those vows nearly quarter of a century later . 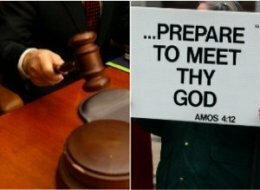 Who sits higher God or the lawyer on the vestry? That was six years ago I have yet to receive a reply. While this example proves that a lawyer can re write marriage vows and force change 23 years into a relationship the same is not applicable to contracts which lawyers write up and claim to be final and unchallengeable even when persons are forced into signing under duress. My experience and observations have has proved that criminals can use our legal system to pervert the course of justice, the one with the money wins. That is neither law nor justice.